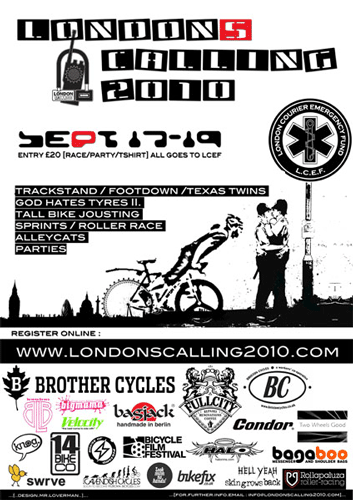 London’s Calling is taking place the week after next and looks like its gonna be ace. Twenty quid entry is a fair bit- I don’t have loads of money, drink in the park rather than the pub and eat a lot of four for a pound noodles…but having said that you get a shirt, events and a party plus all the money goes to the Courier Emergency Fund. So I’ll be putting my hand in my pocket for this one. what do you reckon to David Beckham photographed buying a Fixie? does it mean it’s all over?